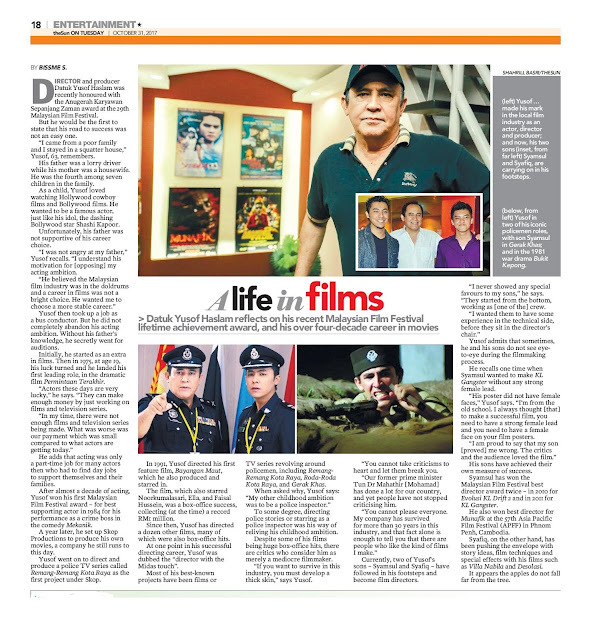 Today theSun interviews Yusof Haslam after winning the life time achievement award at the recent Malaysian film Festival. state that his road to success was not an easy one. “I came from a poor family and I stayed in a squatter house,” Yusof, 63, remembers. His father was a lorry driver while his mother was a housewife. He was the fourth among seven children in the family. As a child, Yusof loved watching Hollywood cowboy films and Bollywood films. He wanted to be a famous actor,just like his idol, the dashing Bollywood star Shashi Kapoor. Unfortunately, his father was not supportive of his career choice. “I was not angry at my father,”Yusof recalls. Yusof then took up a job as a bus conductor. But he did not completely abandon his acting ambition. Without his father’s knowledge, he secretly went for auditions. Initially, he started as an extra in films. Then in 1975, at age 19, his luck turned and he landed his first leading role, in the dramatic film Permintaan Terakhir. “Actors these days are very lucky,” he says. He adds that acting was only a part-time job for many actors then who had to find day jobs to support themselves and their families. After almost a decade of acting, Yusof won his first Malaysian Film Festival award – for best supporting actor in 1984 for his performance as a crime boss in the comedy Mekanik. A year later, he set up Skop Productions to produce his own movies, a company he still runs to this day. Yusof went on to direct and produce a police TV series called Remang-Remang Kota Raya as the first project under Skop. In 1991, Yusof directed his first feature film, Bayangan Maut, which he also produced and starred in. The film, which also starred Noorkumalasari, Ella, and Faisal Hussein, was a box-office success, collecting (at the time) a record RM1 million.Since then, Yusof has directed a dozen other films, many of which were also box-office hits. policemen, including Remang Remang Kota Raya, Roda-Roda Kota Raya, and Gerak Khas. To some degree, directing police stories or starring as a police inspector was his way of reliving his childhood ambition. Despite some of his films being huge box-office hits, there are critics who consider him as merely a mediocre filmmaker. “If you want to survive in this industry, you must develop a thick skin,” says Yusof. “You cannot take criticisms to heart and let them break you.Our former prime minister Tun Dr Mahathir [Mohamad] has done a lot for our country, and yet people have not stopped criticising him. Currently, two of Yusof’s sons – Syamsul and Syafiq – have followed in his footsteps and become film directors. “I never showed any special favours to my sons,” he says. “They started from the bottom, working as [one of the] crew. Yusof admits that sometimes, he and his sons do not see eyeto-eye during the film making process. He recalls one time when Syamsul wanted to make KL Gangster without any strong female lead. “His poster did not have female faces,” Yusof says. “I’m from the old school. I always thought [that] to make a successful film, you need to have a strong female lead and you need to have a female face on your film posters. His sons have achieved their own measure of success. Syamsul has won the Malaysian Film Festival best director award twice – in 2010 for Evolusi KL Drift 2 and in 2011 forKL Gangster. He also won best director for Munafik at the 57th Asia PacificFilm Festival (APFF) in Phnom Penh, Cambodia. Syafiq, on the other hand, has been pushing the envelope with story ideas, film techniques and special effects with his films such as Villa Nabila and Desolasi. It appears the apples do not fall far from the tree.